He was born in Bago City, Occidental Negros on August 24, 1890, being the eldest son of Angel Vargas Tiongco of Molo, Iloilo City and Filomena Celis Trinidad of Bago, Negros Occidental. He learned his first letters under the private tutorship of Eustaquio Torres in Bago; later went to Bago public School, 1899, Colegio de Niño de Bago under Emiliano Trinidad, 1900-1901; Kabankalan Public School, 1902; and Rizal Institute (Bacolod High School), 1903-1909, being valedictorian of the first graduating class. Continuing his studies in Manila, he entered the university of the Philippines in 1909-1914, received his Bachelor of Arts degree in 1911, and Bachelor of Laws degree with honors in 1914 as valedictorian. He was admitted to the Philippine bar in September 1914, and to the U.S. supreme Court practice in April 1919. While a student in the University of the Philippines, in the Philippine Carnival Essay Contest in 1909, he won the prize consisting of W.E. Retana’s Vida y Escritos de Jose Rizal. In the same year, he became a member of the Junior Philippine Assembly, 1909-1910. He qualified in the pensionado competitive examination in 1914, but was not sent to the United States due to lack of funds. He was appointed law clerk, Philippines Commission, January 1915; private secretary to Commissioner Jaime C. de Veyra in 1915; private secretary to the Secretary of Commerce and Police, January 1916; private secretary to the Interior; September 1916; chief clerk, Department of Interior upon the reorganization of the Executive Department in 1917; legislative secretary to Speaker Sergio Osmeña, House of representatives, May 1917-1918. Vargas was commissioned Major, Judge Advocate General’s Department, Philippine National Guard, 1917; aide and secretary to President Manuel L. Quezon as Chairman of Mission and Executive Secretary, First Philippine Independence Mission, 1918-1919; secretary to President Manuel L. Quezon, January 1920. He became Assistant Director, Bureau of Commerce and Industry, April 1920 – January 1922, then Acting Director, June 1920 – September 1921; member and secretary of the Militia Commission, June 1920; Acting Director of Posts, April – May 1920; Secretary, Second Philippine Independence Mission to the U.S., 1922; Undersecretary of Agriculture and Natural Resources, 1928 – 1935. He was designated Executive Secretary, Inauguration Committee, Philippine Commonwealth, 1935; secretary to the President of the Philippines (Executive Secretary) with cabinet rank, 1935 – 1941; Chairman of the Board of Directors. Philippine National Bank, 1936 – 1940. In 1941, Vargas was appointed Acting Secretary of National Defense during the term of President Manuel L. Quezon; mayor of the City of Greater Manila, 1942; chairman of the Philippine Executive Commission, 1942-1943. He became Ambassador to Japan 1943-1945; Chairman of the National Planning Commission, 1946-1954; and member of the Board of Regents, University of the Philippines, 1961-1965. President of the Binalbagan Sugar Estate, 1936-1940; President of the Kawilihan Corporations; President of the Jorge b. Vargas, Inc.; President of the American Biscuit Co., Inc.
Chairman of the Board of Directors of the Imperial Hotel Ltd. (Hongkong); Chairman of the Board of Directors of the Atlantic-Pacific Corporation; Chairman of the Board of Directors of Grech Food Industries, Inc., Chairman of the Board of Directors of Services Ultra Marketing Corporation. As a sports enthusiasts, he was a charter member of the Philippine Amateur Athletic Federation and member of its Executive Committee, 1918-1928; its Vice President in 1929-1935; its President in 1935-1955. Head of the Philippine Delegation to the IXth Far Eastern Games in Tokyo, 1930; head of the Philippine delegation to the Games on London, 1948; and Helsinki, 1952. Representative of the Philippines in the First Congress of Asian Games Federation in New Delhi, 1950; President of the Asian Games Federation, 1950-1954; member of its Executive Committee in 1954-1958; and honorary president of same for life. He was elected member of the International Olympic Committee since 1936. When Judge Manuel Camus died, the burden of the presidency of the growing Boy Scout Movement in the Philippines was taken over by Jorge B. Vargas. He held the post of president and chief scout until 1960. Mr. Vargas’ connection with the local scouting Movement dates back as far as 1935. On that year, he became a member of the Executive Board of the Philippine Council, Boy Scouts of America. Together with the other six incorporators of the Boy Scouts of the Philippines (BSP), he was greatly instrumental in the passage and subsequent approval of Commonwealth Act No. 111. Upon approval of this bill, he was elected first vice president of the BSP. In 1941, when Col. Steve not had to make an extensive leave from the organization, he was designated acting President. BSP president Vargas had served as a member of the Boy Scouts International Committee. From this body, he was awarded the Bronze Wolf Award for his distinguished and meritorious services in the promotion of International Scouting. He is also a holder of the highest Scouting awards from a number of foreign countries. From Canada he received the Silver Fox Award. The British Boy Scouts Association awarded him the Silver Wolf and from Japan, he was the recipient of the White Eagle Award. Mr Vargas waqs not only active in many of his organizations but was one of the original founders of the Boy Scout Movement in the Philippines. He was as International Commissioner; a member of the Boy Scout International Committee; head of the Philippine contingents to the Boy Scout World Jamboree held in Switzerland, Canada, England, Japan, and the Philippines; President and Chief Scout of the Boy Scout of the Philippines; and President of the Xth World Jamboree in the Philippines. 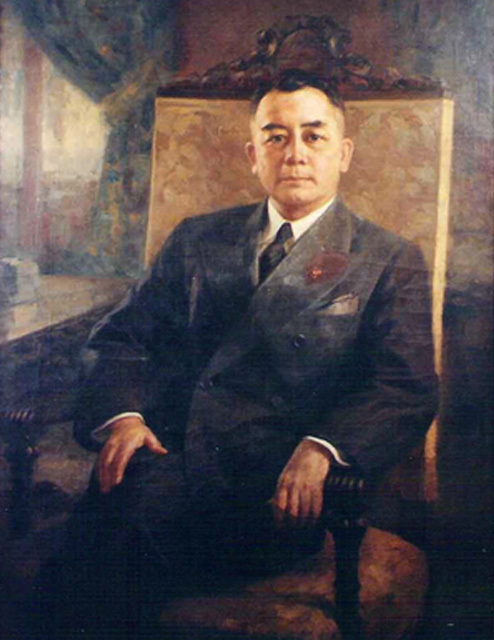 Most Distinguished Alumnus of the University of the Philippines, 1937; First Order of Merit of the Meiji Decoration and Grand Cordon of the Rising Sun (Japan); Colegial de Honor, Colegio de Guadalupe (Spain); and Philippine Legion of Honor (rank of Commander); one of the highest decorations of the Philippine Government. Mr. Vargas was married twice. With his first wife, Marina Yulo of Iloilo City, he had eight children: Jorge Jr.; Angel Federico; Gregorio Roberto; Lourdes Filomena; Eduardo Mariano; Ramon Teodoro; Teresita Carolina; and Maria luisa. He had no children by his second wife, Adelaida Peña y Montilla of Isabela, Negros Occidental. On March 1, 1978, Mr. Jorge B. Vargas bequeathed his collection of art, stamps and coins, his library, personal papers and memorabilia to his Alma Mater, the University of the Philippines. Vargas died on February 22, 1980 at the Makati Medical Center, Makati City, Philippines. The diary of Jorge Vargas was written during his detention in Japan (in Tokyo’s Sugamo Prison) for a nine month period from 1945-1946, and was published as an appendix in The Burden of Proof: The Laurel-Vargas Collaboration Case by Teodoro A. Agoncillo (University of the Philippines Press, Manila, 1984). Readers are urged to consult the original publication, now out of print.